A memorial to the sinking of the Montevideo Maru, Australia’s greatest disaster at sea, will be unveiled at a ceremony at Subic Bay at 11am tomorrow morning by Australian Ambassador to the Philippines, Rod Smith. TRAGEDY has struck the professional ranks of PNG boxing after 23-year-old Manus welterweight Joel Hayeu succumbed to injuries sustained during his professional debut in a boxing show held last June 21 in Port Moresby. Hayeu, from the Pontoon boxing club of Manus, who fought a torrid six-rounder against Hohola boxing club fighter Kevin Baki, collapsed in his corner after the bout, having only moments earlier congratulated his conqueror after losing a unanimous decision to the 37-year-old Baki. He died last Saturday after being comatose for six days. The young Manusian was commended at ringside by many who witnessed the bout, saying he had shown “unbelievable” courage in a fight he was losing on the cards. Experienced former Australian lightweight champion and current trainer Jeff Malcolm, a man credited with more than 30 years in boxing business, was distress at the manner in which the bout was handled, saying it should have been stopped earlier. “That kid was hurt pretty bad, and it was clear for everyone to see that he was taking a beating, but for some reason, he was allowed to finish the fight,” Malcolm said of Hayeu. The PNG Professional Boxing Federation-promoted “Contender” series was geared towards providing a pathway for aspiring professional boxers in the country to eventually compete for regional titles and gain world rankings. The PNG Professional Boxing Control Board, the body tasked with regulating pro boxing, is inactive after years of dormancy. In the shadow of this latest tragedy, calls have been made for the Government to re-establish the board. A grieving John Hayeu said in Pidgin yesterday he was greatly aggrieved by his son’s demise, adding that his immediate concern was to take his boy home. THE Unagi Oval and the park and playground for children and residents of National Capital District at Gordon recently created by Governor Powes Parkop for their enjoyment will soon be a thing of the past. This is because the National Government has reclassified the land as “commercial”. Lands and Physical Planning Minister Sir Puka Temu, who is also the Deputy Prime Minister, abandoned an earlier decision of his, and decided to declare it commercial. This week, lawyers representing Virgo 65 and Fairhaven Limited, purported owners of the land, instructed the National Capital District Commission to remove all playing equipment at the children’s playground and Unagi Oval. The lawyers told NCDC to comply with the National Gazette of May 6, 2009. In documents made available to The National, Sir Puka appears to have abandoned an earlier recommendation by the PNG Physical Planning Appeals Tribunal. The land was previously considered as “open space” or public reserve. Documents show that in December 2007, Sir Puka had upheld the tribunal’s appeal not to rezone Unagi Park into a commercial area. He had stated then in part that he wished to protect public interest by “ensuring that land is used in accordance with sound physical planning principles (and/or) the need for continuity and consistency of policy or another reason”. But the May 6 National Gazette now says the land has been rezoned. It is unclear why there has been a change of heart. NCD Governor Powes Parkop said he would reserve his comments until he spoke with Prime Minister Sir Michael Somare and Sir Puka. He admitted that he was not happy with the rezoning but would talk to the minister. “Unagi Park should remain a public reserve for recreational purposes for the benefit of the city’s children and families,” he said. It is understood NCDC has already instructed a law firm to go to court to fight this decision. Virgo 65 and Fairhaven Limited are believed to be owned by individuals of Asian origin. Mothers, children and youths who were using the park yesterday afternoon expressed their disgust when told about this decision. Mrs Nguna and another mother Cathy Collin said there were no other place safer and convenient than that specific area as Erima is too dangerous and the other places are too far. Jonathan Wii and Jonathan Kunjil were against the idea of developing the area for commercial. A resident of Wewak Steven Tom who was transiting through Port Moresby to Lihir who was taking a break there admired what the governor of NCD is doing to beautify and develop the city’s parks. PRIME Minister Michael Somare has taken personal charge of advancing PNG’s second liquefied natural gas project development to project agreement status within days. The Grand Chief has become the Mr Fix-it for poor showing by his ministerial and public service minions. He has directed officials to furnish to him a professionally and PNG-produced project development agreement for Liquid Niugini liquefied natural gas project by Wednesday morning, (01 July 2009). According to staffers, a visibly fuming Prime Minister told ministers and officials after a special cabinet meeting that their deceptive schemes and conspiracies to derail one project and behave as salesmen for another project was not in the nation’s best interest. The Grand Chief made his intervention last Friday after several of his key ministers and hand-picked Waigani bureaucrats connived to undermine progress of locking in InterOil Corporation’s planned two-train liquefied natural gas development project. Sir Michael wants both the InterOil and ExxonMobil projects developed simultaneously and on the same terms offered by the State. The Prime Minister vented his ire on ministers and officials when he was given a project agreement concocted by a United Kingdom-based law firm called Allen & Overy who were engaged by the Department of Treasury to produce the document a week ago. The law firm is also retained by ExxonMobil. The document produced at the behest of Treasury Department officials did not carry any negotiated and agreed position both the State and InterOil Corporation negotiation teams worked on over the last two years. The document was worded to deny InterOil’s LNG development company, Liquid Niugini Gas Limited any reasonable concessions and tax breaks that were accorded to ExxonMobil’s PNG LNG project. Yet the State solicitor was coerced into giving his legal clearance to the hurriedly produced document last Wednesday. Petroleum Minister William Duma and Prime Minister’s Chief of Staff Paul Bengo became suspicious when they realised there were two documents doing the rounds in Waigani and not one. That was when the Prime Minister made his intervention. He ordered officials to give him one negotiated and agreed project agreement within five days commencing Friday afternoon and inclusive of Saturday and Sunday. Government officials spend Saturday and Sunday huddled in thought and work at a Port Moresby hotel to meet the deadline on Wednesday morning. ExxonMobil and its partner Oil Search Limited are progressing towards building an LNG project in PNG for a total development cost of some K12 billion and InterOil is doing similarly for total development cost of some K10 billion. Most of ExxonMobil’s LNG facility feedstock is located in PNG’s Southern Highlands Province. InterOil Corporation’s LNG plant will rely on the company’s own Elk-Antelope world-class natural gas and crude oil reservoirs in the Upper Purari River area of PNG’s Gulf of Papua region. ExxonMobil has offered PNG 19.4 percent stake in its project while InterOil has offered PNG 32.5 percent in the upstream, midstream and downstream of its project development. State-owned Petromin Limited is already operating as InterOil Corporation’s partner in InterOil’s upstream exploration program at Elk-Antelope and is positioned to be a significant player in the Liquid Niugini Gas LNG project development. The InterOil project has also allowed for a domestic market obligation of some 40 million cubic metres of gas per annum to be used for PNG’s domestic consumption which the ExxonMobil project does not provide. InterOil will use the project to assist the host province’s long-denied economic development. Susuve Laumaea is an award-winning veteran PNG newspaper journalist. He writes a popular weekly Public Affairs column in Port Moresby-based weekly newspaper, Sunday Chronicle. SIX suspects have been rounded up as police moved swiftly with bulldozers demolishing unlicenced liquor outlets and food stall from Erima Bridge to Five-Mile section of the Sir Hubert Murray Highway last Friday and Saturday. Police, in a joint operation with PNG Power, NCDC and Eda Ranu, cut off illegal water and power connections while chainsaws were used to clear the rain trees, bananas and food gardens. Almost 100 cartons of beer sold in unlicensed premises were confiscated by police as NCD metropolitan commander Chief Supt Fred Yakasa gave a stern warning to settlers to respect the laws or go back home to their village. He also told the people that from now on, there would be no more sale, consumption of liquor and gambling along that stretch of road. “My policemen will patrol these roads and they have been instructed to brukim lek na han (break legs and hands) of people caught breaking that order,” he warned. Settlers gathered last Friday afternoon at Erima oval where Chief Supt Yakasa and his deputy Chief Insp Anderson Bawa appealed to them to hand in more than 10 people involved in the slaying of Dei MP Puri Ruing’s son and a relative last Wednesday night after the State of Origin II game. Chief Supt Yakasa said six suspects had been taken in for questioning and appealed to the community to help surrender another 10-12 suspects still at large. “Enough is enough. We have to do this operation to tell the people that there is law and people must have respect for the laws.” he said. Chief Supt Yakasa said settlers had made illegal power and water connections and had been illegally selling alcohol for a very long time. He also commended Mr Ruing for not taking the law into his own hands and telling his people not to retaliate. “Mr Ruing is a strong leader. I admire him and commend him for letting police handle the matter,” Chief Supt Yakasa said. He also warned other settlements at Vadavada, Nine-Mile, Gerehu and Two-Mile Hill that police would move in and flush out people who harbour criminal elements. He said police would move into Two-Mile Hill settlement on Wednesday and he would close all bus-stops along Two-Mile Hill where there have been numerous hold-ups and bag snatching from passengers. 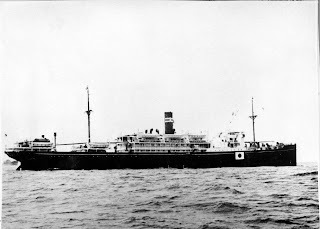 The hardest thing for families who lost relatives in the sinking of the Montevideo Maru (pictured) during World War II was not knowing the fate of their loved ones. Ailsa Nisbet, 82, along with her daughter Marg Curtis and cousin Ron Hayes, will represent one of 15 Australian families at the July 1 memorial at Subic Bay, on the Philippines west coast. They leave Melbourne on Monday to pay respects to Nisbet's brother Private John `Jack' Groat, who was on board the Montevideo Maru when it sank on July 1, 1942, carrying 845 prisoners of war from Australia's Lark Force and 208 civilian men. The troops had been taken prisoner after Japan invaded Rabaul in Papua New Guinea's East New Britain province in January 1942. The sinking of the ship was not reported back to Australia, and for several years the fate of the prisoners of war was unknown. Nisbet said for years it was a mystery as to what happened to her brother. "The family was first told he was missing," she told AAP. "Then they said `missing presumed dead', then we got a message he was a prisoner of war, then we got a letter from Jack saying he was being looked after by the Japanese. 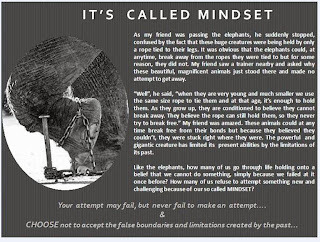 "But that's all. Mum didn't hear what happened until late 1945. "And there is still doubt about it," she said. In 1997, Nisbet visited Rabaul to see where her brother was stationed and earlier this year for Anzac Day, Curtis and Hayes completed a three-day trek retracing the escape many Larkforce men had to make during Japanese occupation. "It's a very emotional trip," Nisbet said. "It's been many, many years and nothing has been heard of the Montevideo Maru and it's just all coming out now. "I'm the last member of the family and it will be a closure for me to go up there." Former federal Labor leader Kim Beazley, whose uncle Reverend Sydney Beazley was lost on the ship, is the patron of the Montevideo Maru Memorial Committee. Phil Ainsworth, in the Philippines for the event, said the committee aims to get more national recognition for the tragedy. "This memorial will give the families some comfort because even now 67 years later they still feel discomforted and in grief," he said. Another attendee is Andrea Williams whose grandfather and great uncle were on board. She wants a government response similar to that for the recently-found HMAS Sydney, another World War II sea tragedy that claimed 645 lives. "There is a fair amount of literature on the Montevideo sinking but there are some nagging specifics, like why there was no inquiry into the fate of these men," she said. "It is still a secret as to why these men were left to their fate." Australian archives had several passenger lists but they were inconsistent and there was no passenger manifest, she said. "What has happened to the nominal roll of the men apparently on board?" Veteran Affairs Minister Alan Griffin marked the 67th anniversary of the sinking of the Montevideo Maru by giving a speech to parliament last Friday. Griffin said the Australian government put $7,200 towards the memorial and the Australian Ambassador to the Philippines Rod Smith will attend. "I've spoken to individuals who lost family members as part of the Montevideo Maru and I know these things remain with people forever," he said. "I express my heartfelt sympathy for their loss. "I told parliament it was shrouded in mystery and that must have added to their loss." Adapted from an article by Nuri Vittachi, sometime journalist with the Macau Post and other newspapers in Asia. 1. The phrase 'Big Mac' referred to a large Scottish tourist. 2. The Queen of England was generally considered to be the Queen of the Whole Wide World. 3. At government offices you had to pay a special fee to do anything, including paying special fees. 5. Each city had just one TV station a few cinemas but there was a better choice of what to watch then even though we have over 500 channels and even fewer cinemas now. 6. If you wanted to withdraw money from a bank you had to take a day off work. 7. All light-haired, round-eyed people were referred to as Europeans, no matter where they came from. Former President George Bush is still referred to as a European in some parts of Asia. 8. Europeans were generally hated and despised but if one invited you to tea, it was considered a very great honour. 9. All toffee-coloured, curry-devouring people were known as Indians, even if they had been born raised and had lived and died without ever having been within a thousand kilometers of India. 10. Petrol was bought in tiny quantities, often in jam jars [still true today in parts of Indo-China and other places]. 11. If you asked children their mother's name, they would often reply,'Which one?'. 12. Blood donating was seen as a legitimate way of earning money, and so was blood spilling. TELIKOM is making cheaper, high quality wireless telephone and internet services available to its customers. With its wireless phone launched recently, customers can make a call at peak hours for 6toea a minute, and 3toea a minute during off peak hours. The new service started at 10pm last Thursday. Last Thursday afternoon, the company announced it now has on the market wireless high speed internet, initially for Port Moresby and Madang only. Lae will be hooked up this week, and the other major towns thereafter. Telikom chief executive officer Peter Loko unveiled the new product to reporters during a press conference last Thursday. Customers will have access to high speed internet access, which downloads data at speeds of up to 1Mb/second via the wireless telephone at home. It is available through Telikom’s X’cess fixed wireless network. Also, a simple USB plug-in device provides wireless access to the internet at high speed through any enabled laptop or PC, separate from the phone, anywhere within range of the fixed wireless signal, which is about 50km. Telikom estimates that 90,000 new customers will join the fixed wireless network by the end of the year, and they have the opportunity to have the internet access on either a medium speed of 153kbps, or on the High Speed Telikom plan. “This is exciting new technology, but simple, and available at low cost to Papua New Guinea grassroots as well as big business, and it is being taken up with great enthusiasm,” Mr Loko said. “The high speed wireless access speed and wireless portability has an introductory special price of K199, plus a monthly fee, and has 1Mb per second download capability, anywhere in PNG within range of our wireless network. “It’s revolutionary, it’s cheap, and it is going to bring thousands of people into wireless internet access,” Mr Loko said. Asked if the move to the wireless technology would mean rendering the fixed and cable network obsolete, Mr Loko said the market would decide that. Telikom recently invested a lot of money to upgrade its cable network. The new wireless internet product will be the envy of other internet service providers. Asked if Telikom’s entry into the market would create regulatory issues, company officials said they were “within the legal and regulatory boundary”. THREE men were killed in Port Moresby and several others injured last Wednesday night as celebrations after the Maroons’ historic victory in the State of Origin rugby league series turned bloody. Three men, two of them university students, were beaten and slashed to death at a Five-Mile Settlement. One of the victims was the son of Puri Ruing, the MP for Dei Open in Western Highlands province. In Hohola, a man from Southern Highlands was hit by a police vehicle early yesterday morning as he ran across the road. He was taken to the Port Moresby General Hospital and is in a critical but stable condition. His relatives, who live at Silkwood Street, vented their anger on motorists travelling along there, damaging at least five vehicles. At Five-Mile, a grieving Mr Ruing was in shock after learning that his 21-year-old son, Manuel, and nephew Joel Aiwa, also 21, had been murdered at the settlement. The identity of the third deceased could not be ascertained yesterday. A spokesperson for the family, Geoffrey Kuri, said the two had watched the State of Origin match at their Five-Mile home and at about 11pm, they decided to go out and buy a few drinks at the settlement. He said the pair were attacked by a mob of drunkards from the settlement, who slashed them with bush knives and other weapons. Mr Kuri said the two victims were doing their matriculation studies at the University of Papua New Guinea’s Open campus. “Their bodies were mutilated and their heads and other body parts were badly chopped up. It was a barbaric act by the attackers who did not have mercy on another human being’s life,” Mr Kuri said. The Five-Mile Settlement area has become a notorious place in NCD, where people sell alcohol illegally, residents say. “Every week a person is being killed in this particular part of the city and this is not the first time. “We as a family have suffered a double loss,” Mr Kuri said. Mr Ruing appealed to NCD metropolitan commander, Chief Supt Fred Yakasa, to work round the clock to arrest the perpetrators of the murder who are said to be still at large. “As a leader in the country, I cannot take the law into my own hands and ask my tribe to retaliate. “No, let the law take control of the situation. “Let us respect the law of the land, but police have to act immediately,” Mr Ruing said. He said there was an alarming breakdown of law and order in the country, and nobody could feel safe anymore. “The police force alone can’t be blamed for this. “It is the National Government and all other sectors in the country. “We have to take a joint approach to solve this very serious problem,” Mr Ruing added. Dr Sam Yakopua, who is in charge of Accidents and Emergency at the Port Moresby General Hospital, confirmed that they had received the three bodies on Wednesday night. Dr Yakopua said eight injuries were also reported, one of them very serious. “It’s ridiculous, these injuries from violence related to the Origin match,” he said. He confirmed the deaths of the two students from heavy bleeding resulting from knife wounds to the head, limbs and other parts of the body. 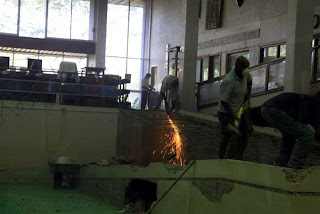 Library renovations (pictured) have begun at Pacific Adventist University's (PAU) Koiari Park campus near Port Moresby. The renovations – which have been two years in the planning and which are expected to cost approximately K400, 000 - are anticipated to be complete in early Semester 2, 2009. The library renovations will result in new study areas, additional shelving, an upgraded post-graduate and research facility, increased computer space and new staff offices. The library expansion will include the dedication of the library’s recently-updated computer facilities that students have had to towards the end of last semester. The computer facilities include an increase of library computers by almost 800%, further expanded wireless access to internet and related services and additional electricity outlets for laptop computers. 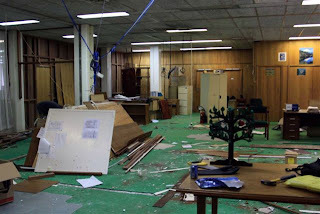 To increase the space available, a number of internal walls will be removed that are no longer needed since the administration team moved into a dedicated building at the end of 2008. Another key part of the renovations will be the removal of the large ramp taking up most of the library’s downstairs floor. In its place a redesigned ramp will be installed to continue to provide access to those with physical impairments. The K400, 000 needed for the library renovations and repairs have been made possible through generous donations from members of the Seventh Day Adventist church across Papua New Guinea, Australia, New Zealand and the Pacific. The work for the renovations work is being completed and managed by PAU's internal support services team during the semester break. PAU is a tertiary institution owned and operated by the SDA Church, offering diploma, bachelor and post-graduate awards in a range of disciplines. PAU is located at Koiari Park, 14 miles from Port Moresby, PNG with affiliate campuses Fulton (Suva, Fiji) and Sonoma College (East New Britain province, PNG). TWO generations afterwards, World War II in New Guinea means simply Kokoda to most Australians. Perhaps also Milne Bay, where the Japanese were first defeated. But the memory tends to cloud at mention of Buna, Gona, the Markham Valley, Shaggy Ridge and Scarlet Beach, Finschhafen - all great Australian victories in impossible conditions - and Salamaua. Yet it was in Salamaua, in the early hours of June 29, 1942, that Australian commandos struck the first blow in the Pacific land war. The raid has been acclaimed as a copybook action for its diligent scouting, meticulous planning and audacious, multi-pronged attack against an enemy force 10 times the attackers' strength. All without loss of life. The Japanese, well fed and complacent, were surprised and humiliated by a puny Australian force that had struggled for days over the jungle ranges with weapons, ammunition and heavy packs, then camped and planned their raid under the noses of the enemy. The response, to reinforce the base, tied down thousands of troops that would otherwise have been thrown into the Kokoda and Milne Bay battles a few months later. Today Salamaua is little more than a couple of native villages and some holiday shacks for expatriates and tourists. But in the 1930s it was the Australian administration's district headquarters and a thriving commercial centre. From its airstrip, the three-engined Junkers cargo planes flew huge gold dredges into the Bulolo valley, piece by piece. At the time, that was the biggest commercial airlift in the world. All ended with the Japanese landing on March 8, 1942, virtually unopposed, bringing the enemy one step closer in its plan to isolate and neutralise Australia. When the Australians had to abandon Salamaua, a handful of pre-war residents - patrol officers, clerks, miners and traders - were hastily co-opted into the New Guinea Volunteer Rifles and went bush to keep an eye on the invaders. They became the scouts who lived in the hills overlooking the Salamaua isthmus, noting and recording the defences and habits of the enemy. They were so close they could hear the bell ringing to warn of an air raid. Damien Parer took his famous photograph of the isthmus from their observation post. In mid-1942, the only fit, trained troops Australia had in the area were about 450 men of the 2/5th Independent (commando) Company. Too small a force to draw the Japanese into battle, their task was to harass the enemy at their bases of Lae and Salamaua. The task of planning and leading the attack on Salamaua went to captain Norman Winning, a wiry red-headed Scot instantly nick-named "the Red Steer", a dynamic, inventive born leader. NGVR sergeant Jim McAdam, who I knew in his later life as director of forests in the PNG administration, led his scouts up to the houses where the Japanese were sleeping to assess the enemy strength. Then, as silently as they had slipped in, they returned to the Australian forward base, only 5km from Salamaua, to transfer their vital intelligence to a sand model of the Japanese base. With Winning, they planned the raid down to the last detail. Starting at 2pm on June 28, seven sections moved out through thick bush, native gardens and pit swamp to get close to their targets: the airfield, wireless masts, a strategic bridge and troop billets. One team lugged a heavy 3-inch (7.6cm) mortar that would keep the Japanese on the isthmus pinned down. The rest were armed with Tommy guns, rifles and a few Bren guns. Every man had two grenades and a pistol and carried extra ammunition. But their most devastating weapon was their homemade "sticky bomb", an anti-tank grenade wrapped with packs of the explosive TNT. The night was black. It rained heavily but at midnight the moon broke through. At 3.14am, one minute before zero hour, almost everyone was in position. A Japanese sentry walked out to relieve himself and found himself staring at a blackened-face commando. He screamed the alarm and was immediately cut down by a burst of machine-gun fire. The raid was on. Years later, the men of the 2/5th told their stories of that night in a series of laconic anecdotes for the unit's war history Commando Double Black. Corporal Bernie Davis's account: "I raced up the steps of the building, tore it open and hurled my sticky bomb inside, yelling: 'Share that for breakfast, you bastards!' The bomb went off, blew the door off its hinges and sent me somersaulting into the garden. 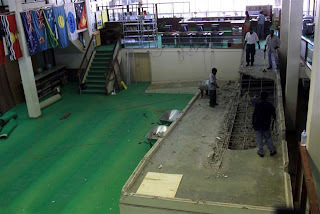 Some of the surviving Japanese were escaping through a trapdoor in the floor. Squatting on the ground was an enterprising Aussie. He was calmly killing the enemy one by one as they landed on the ground. He looked like he was stacking bags of wheat under the hut, until the supply of Japs ran out." Don Suter, NGVR: "Our mortar unit fired 36 bombs. One of them fell directly on the most important target, a strongpoint at the neck of the isthmus. Fifteen Japanese were in this post." Sergeant Mal Bishop was wounded as he threw his bomb into one of the old Chinese trade stores: "The next thing I knew was a severe blow on the right shoulder, which put me down on my knees. I scrambled to my feet when my bomb went off." After three-quarters of an hour of destruction, killing 120 of the enemy, two red flares signalled the withdrawal. Ken "Andy" Knox was covering the pullout with his Bren gun. His mate Cliff Biggs, refilling the magazines, complained: "You're firing a bit low, aren't you? My face is covered in mud. I reckon you're hitting the ground about a foot in front of the bloody gun." "Stop your bloody grizzling, Cliff, and say a bloody prayer," replied Knox. "That mud is from the Japanese bullets coming towards us." The great prize of the operation was a bag of documents a Japanese pilot was trying to fly out when he was killed. They contained the plans of the landings at Buna and Milne Bay. Pre-war skiing champion Bill Harris ran back 50km over the mountains in two days to deliver them to Kanga Force HQ. The warning enabled Australian divisions to be recalled from leave and rushed to reinforce Milne Bay. The commanding officer of Kanga Force, Lieutenant Colonel Fleay, who never left Wau, was awarded the DSO for personal gallantry. Not one of the men on the Salamaua operation, the first and most successful commando raid of the war, received a decoration. The surviving men of the 2/5th are still asking why. 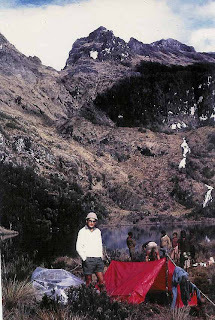 Geoffrey Luck was a reporter in Papua New Guinea for seven years. Pop star Michael Jackson has died in Los Angeles, aged 50, reports (http://news.bbc.co.uk/2/hi/entertainment/8119993.stm ) say. Paramedics were called to the singer's home around midday local time on Thursday after he stopped breathing and suffered a suspected cardiac arrest. He was rushed by ambulance to a local medical centre, but his death was announced shortly afterwards. The star, who had a history of health problems, had been due to begin a series of comeback concerts in the UK on 13 July. Jackson had a history of health problems and had not completed a concert tour in 12 years. Concerns were raised last month when four of his "comeback" concerts were pushed back, but organisers insisted the dates had been moved due to the sheer magnitude of the spectacle. Uri Gellar, a close friend of the star, told BBC News: "I'm devastated - it's very, very sad. "I'm still trying to hold on to the glimmer that it's not true. It's too surreal for me to absorb that Michael is no longer with us." US media reports said paramedics were called to the singer's house in Bel Air at midday. Crowds have begun to gather outside the facility, whose emergency centre has been roped off by police. He then went on to achieve global fame as a solo artist with smash hits such as "Thriller" and "Bad". But the singer has been dogged by controversy and money trouble in recent years, becoming a virtual recluse. He had three children, Michael Joseph Jackson Jr, Paris Michael Katherine Jackson and Prince Michael Jackson II. 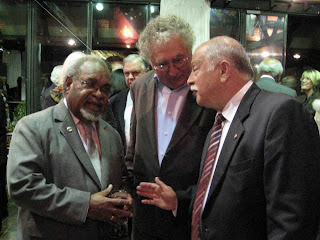 An increasing number of Papua New Guineans and Australians are now turning to the ground-breaking PNG Attitude website (http://asopa.typepad.com/) and newsletter, two outlets with growing influence in both countries for their candid commentary on Australia-PNG affairs. Both are published by former PNG-based teacher and journalist, Keith Jackson, 64, who is chairman of the Sydney-based public relations firm Jackson Wells. He lived in PNG from age 18 to 31 and still feels a strong sense of commitment to the country and its people. PNG Attitude offers a range of views on current Australia-PNG issues from contributors such as Paul Oates, Gelab Piak, Ilya Gridneff, Bernard Narokobi, Don Hook and many guest writers. Mr Jackson is passionate about using communications processes to build closer relationships between the people of Australia and PNG. He believes the political relationship has been neglected until recently, and that the civil relationship has a long way to go. “We’re like a family that’s drifted apart,” Mr Jackson says. He says he has some crucial questions he believes Australians want answered about PNG. “I asked Sir Michael most of them a couple of months ago through an intermediary, but they obviously didn’t get to him. “We’re not sure about the next generation of PNG politicians. Are they likely to be nation builders – and friendly towards Australia? “The recent anti-Asian riots indicate a big problem for PNG. They seem to show that Papua New Guineans are being excluded from commerce in their own country. What’s going on? “These are tough questions,” says Mr Jackson, “but, where I come from in the Australian bush they’d be considered fair. And they need to be answered. “Why do they need to be answered? Because there’s an underlying suspicion amongst Australians who would be PNG’s best friends that there’s a lot going on that doesn’t smell right. 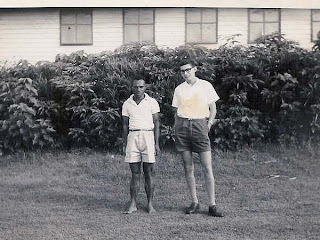 After finishing high school, Mr Jackson became a cadet education officer at the Australian School of Pacific Administration (ASOPA) in 1962-63, arriving in PNG in November 1963 as an 18-year-old school teacher. His first posting was as head teacher of the Kundiawa Primary A School, where he also established a local newspaper, the Kundiawa News, and became a correspondent for the Australian Broadcasting Commission, South Pacific Post and Pacific Islands Monthly. After teaching for three years, he was transferred to Port Moresby as editor of school publications and, a year later, joined the ABC to write and produce broadcasts for PNG schools. Mr Jackson left the ABC to join the PNG Government Broadcasting Service in 1970, managing Radio Rabaul and Radio Bougainville. Around the time of Independence, he was appointed head of policy and planning in the new National Broadcasting Commission. Reflecting on PNG’s impact on his life, he says: “I built my career in PNG, I married there, got my degree there, my first two kids were born there, and I made many, many friends. “I retain a great affection for the country and its people. 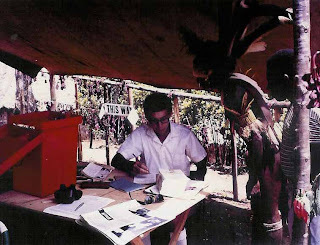 After leaving PNG in 1976, Mr Jackson developed broadcasting systems in Indonesia, the Maldives, India, the Philippines and Fiji. Back in Australia, he established radio stations in Armidale and Sydney. In 1983, he became a lecturer at ASOPA's successor, the International Training Institute, ending up as principal. In 1985 he returned to the ABC as a general manager before establishing his company, Jackson Wells, in 1991. “I left PNG but it never really left me,” Mr Jackson says. Mr Jackson has got the credentials and the awards. His first degree was a BA in economics and political science from the University of Papua New Guinea and he went on to get a Graduate Diploma in Management from the University of New England. He was awarded the PNG Independence Medal in 1976 and became a Member of the Order of Australia in 2004 for services to management and training in media, communications and public relations. His interest in PNG remains undiminished. He was president of the Papua New Guinea Association of Australia (PNGAA) in 2008-2009 and is currently working on a number of projects related to PNG. After helping to establish New Dawn FM in Bougainville Mr Jackson continues to work with its manager, Aloysius Laukai, on its news website. He’s chairman of the Montevideo Maru Memorial Committee. He’s working on a project to recognise the work of kiaps in PNG. And he’s trying to get books about PNG history into PNG schools. “PNG has a rich and proud history,” Mr Jackson says. “There are books that tell that history. “They are not in the schools. State of Origin is a waste of time! Venue Central: Venue finding made easy! Sir Mekere, where are you? Will you feel guilty when the 'CARBON COPS' call? National Geographic best pictures for the year! Reaching the 50,000 mark...the sky is the limit! Our cucumbers are growing again!